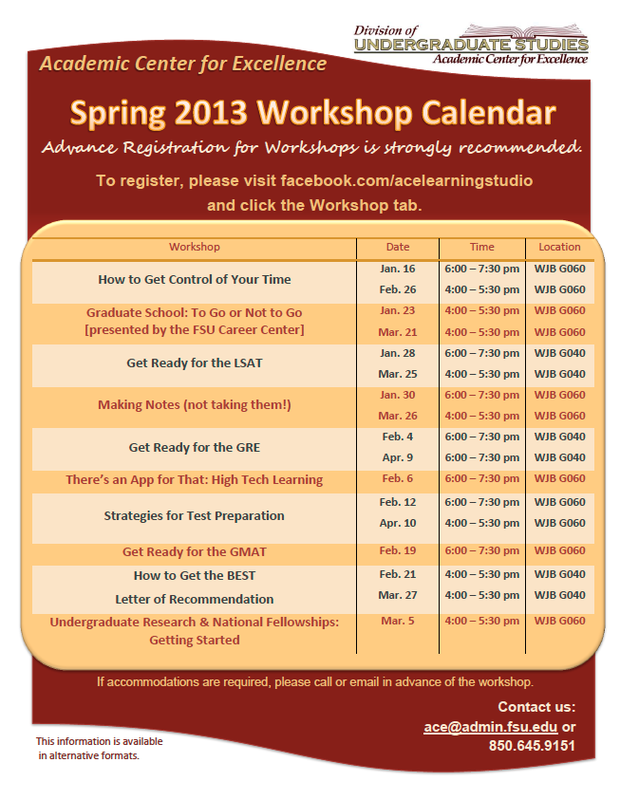 The Academic Center for Excellence has set the calendar for its Spring Workshops. I have attached the flyer with the calendar for you to post and share with your students. For Spring we have added two new workshops. There’s an App for That: High Tech Learning explores apps for ipads, iphones and other technology that can be used to enhance learning. Undergraduate Research & National Fellowships: Getting Started is presented by representatives from the Office of National Fellowships and Office of Undergraduate Research. It is geared toward any undergraduate student looking to get started with these programs. Also new this year, students can register for the workshops through our facebook page: facebook.com/acelearningstudio. As always, the ACE Workshops are FREE to all registered FSU students.